Even if you’re watchable but you’re terrible at the game, it’s almost offensive to see people not play the game well. 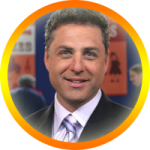 When he’s not talking to experts around the country about antiques while hosting the hit PBS show Antiques Roadshow, Mark L. Walberg’s the host of the nationally-syndicated show The Game Plane, as well as one of the hosts of the traveling Price is Right Live circuit. He’s also been the host of several different game shows, including Russian Roulette and On the Cover. We talk about what makes a good contestant, from the eyes of a host. If you win, fantastic! If you don’t, oh well; it was still a blast. That attitude of, ‘highly competitive but it’s not the end of the world’ really sells the home audience. I talked to Mark for this piece because of his unique viewpoint: he’s been on both sides of the podium, having competed on three game shows himself: The Weakest Link, Street Smarts and Lingo. “And I won all three of them, I just wanna let you know. I may be better as a contestant than as a host,” he tells me with a laugh. And being a model contestant necessitates knowing the game you’re applying to back-to-front. And listen! Listen to the host, listen to the game, and pay attention. One, you look better and two, you have a better chance of being successful. A good host is supposed to make the contestant the star of the show. But trying to out-joke the joke makes you look attention hungry.